The moment I heard those words, I panicked. What on earth should we do? Call 911? Put out an APB? Organize a search party? This was dreadful news. Absolutely dreadful. 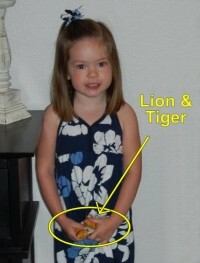 After all, Lion and Tiger were my granddaughter Avery's favorite toys. Granted they weren't the kind of warm, fuzzy stuffed animals that would normally captivate a three-year-old. They were just a couple of little hard plastic zoo animals that came out of a big bag of critters I'd bought at Walgreen's for her older brother Aidan when he was just a year old. But even though they weren't soft and cuddly Avery had taken up with them anyway, and for the past year of her life you'd be hard pressed to see a single photo of her without Lion and Tiger clutched tightly in her chubby little fists. And now they were gone. Not "missing” – as in "Did you check down under the sofa cushions or in the cup-holder of her car seat?” I mean GONE. 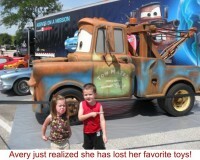 Apparently she had them in her hand last Saturday while waiting in line for two hours in the parking lot of a local shopping mall, to have her picture made with replicas of the automobiles featured in the Disney movie‘Cars 2', and it wasn't until they got to the front of the line that she realized Lion and Tiger had been dropped on the ground somewhere. Efforts to retrace her steps proved fruitless because obviously some small person had already picked them up. Alas, short of frisking 1,256 children to determine the guilty party, there was nothing left to do but officially declare the animals lost. Oh the tears. The anguish. The distress. (And if you think that's bad, you should have seenAvery'sreaction!) Lauren tried to console her daughter at bedtime with another animal, but it wasn't the same. I mean let's face it – when you're used to a lion and a tiger, who wants to sleep with an ostrich, really? Meanwhile, halfway across the country Grammy (aka: me) was hot on the trail of a permanent replacement. Easier said than done. Remember, the originals came from the junky toy aisle at a drugstore four years earlier, and if you think I could just walk in and find the same item today, you obviously don't know your junky drugstore aisles very well. Target, ToysRUs and Amazon weren't much help and neither was EBay. The ones they had were either too big or too small, or they didn't look at all like Lion and Tiger. 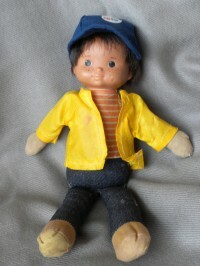 In a lot of ways Michael Banks' untimely disappearance was similar to that of Avery's beloved animals, right down to the part about my feeling guilty as a mother for letting my three-year-old daughter take her favorite toy into a situation where it would most certainly get lost. In this case it happened to be a carnival that had a hot-air balloon you could actually go up in. (The balloon was tethered to the ground, of course, so that we only ascended about three stories high, but it was a thrilling ride nonetheless.) It wasn't until we got home later that afternoon that I discovered Michael Banks had been left in the basket of the balloon. I managed to soothe my distraught daughter with some cockamamie story about how Michael was off on a grand adventure in the balloon; and by golly I did such a bang-up job of it that a month later when my husband happened upon an identical doll in an airport gift shop and brought it home in his suitcase, Michael Banks' surprise return was so remarkable it almost had me believing my own tall tales! Taking a cue from that experience, my daughter has fully convinced Avery that Lion and Tiger are touring the country with the characters from "Cars 2”. So much so, in fact, that when the packet of animals I ordered yesterday from an obscure online toy store finally arrives at her house, I wish I could be there because I'm dying to hear all about what Lightening McQueen and Mater are really like in person! Search for Grandchildren articles similar to "Lion and Tiger are Lost, Oh My!. Search all articles similar to "Lion and Tiger are Lost, Oh My! ".